My latest obsession is #haters. But not just any haters. Haters who hate for the sake of hating. The absolute bottom of the barrel of hate. Blind hate. Senseless hate. Hate that defies all logic. And in the case of sports fans, hate without recourse. Hate that festers unfulfilled over a lifetime of anguish, eventually boiling over in a stream of vitriol directed at teams that aren't listening and couldn't care less – no matter how much money you spend on garlic fries and panda hats. Hate borne of an inability to do a damn thing about how one's team handles its business. 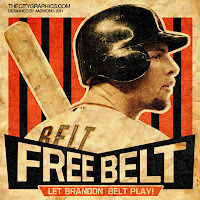 Take, for use of a convenient example, the recent #FreeBelt phenomenon. Anyone who follows los Gigantes and their 253 thousand followers on the Twitter thingy knows the hate for Bruce Bochy goes far beyond his reluctance to get down on his knees and bow at the altar of the Baby Giraffe. 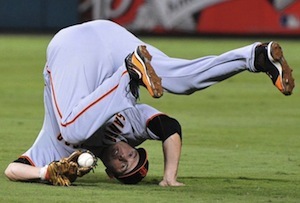 It extends to any opportunity our grizzled ol' manager takes to tweak the lineup. OK, so April wound up 12-10. Not bad, considering an 0-3 start, a struggling ace, a lost closer, a projected starting second baseman who never played and Aubrey Huff’s ineffectual start and subsequent anxiety issues. Makes you think, don't it? Wasn't this year supposed to be easier? 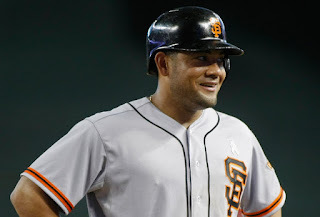 Hadn't Los Gigantes kicked the injury bug that plagued them throughout 2011 after successfully avoiding major trips to the trainer's table in the Year of Glory 2010? 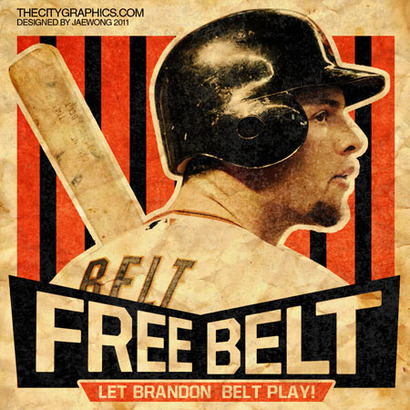 Wasn't Aubrey Huff supposed to rebound with his typically inflated even-year production after stealing the Rally Thong back from the Hall of Fame? Didn't Dave Groeschner find a magic potion to heal Freddy Sanchez of his San-Francisco-itis once and for all?